This weekend I was actually able to walk around without a jacket!! We took a stroll along the east river and snapped some shots by the water taxi dock. I SO miss taking the water taxi — it is by far the best way to commute to work in NYC! 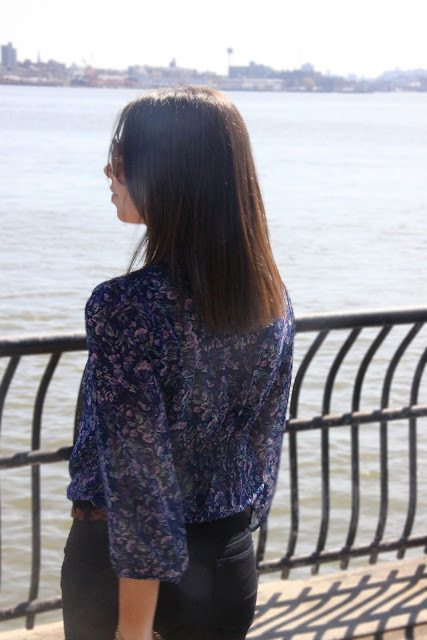 My outfit was casual and comfy and there’s nothing like a billowy floral top for Spring. I’ve also been fond of mixing blacks and browns lately! Who’s excited for The Bachelor Season Finale tonight?!?! Also, this week I’ll be posting my first giveaway!! YAYA! Be sure to check back. I have those boots! Love them! i LOVE your top… and those boots! Those Gap jeggings look like they fit well! Cute outfit! !